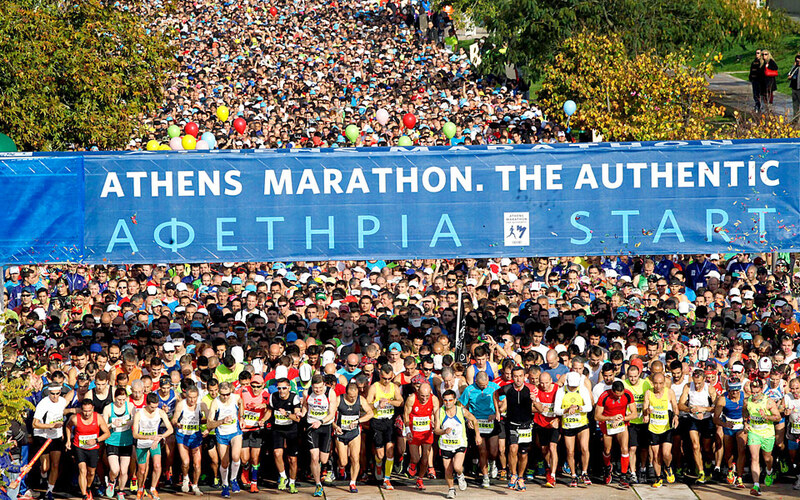 The Athens Classic (authentic) Marathon is an annual marathon road race held in Athens, Greece, normally in early November. The race attracted 43.000 competitors in 2015 of which 16.000 were for the 42.195 km course, both numbers being an all-time record for the event. The rest of the runners competed in the concurrent 5 and 10 kilometres road races and the racewalking contest. It is perhaps the most difficult major marathon race: the course is uphill from the 10 km mark to the 31 km mark – the toughest uphill climb of any major marathon. The course begins in the town of Marathon, where it passes the tomb of the Athenian soldiers, and it traces a path near the coast through Nea Makri. Following the steep rise, the course goes lightly downhill towards the city of Athens. It passes a statue of a runner (Ο Δρομ?ας) in the city centre before finishing up at the Panathinaiko Stadium; a site for athletics competitions in ancient times and the finishing point for both the 1896 and 2004 Olympic marathons. It was a true triumph accomplished by a news-bearing foot soldier from ancient Athens, who announced - with his last words - the victory of the Greeks against the Persians during the Marathon Battle in 490 BC. The 42,195m Marathon Race became one of the most competitive events during the revival of the Olympic Games in 1896. A Greek athlete named Spyros Louis, running what has ever since been referred to as the Original Marathon Course from the ancient city of Marathon to the Panathenaic Stadium in Athens, won the gold medal of the first modern Olympic Games and became a legend of Greek and International Athletics. The Marathon Race has always had a prominent place in the hearts and minds of sports enthusiasts, as it represents the highest effort where the human body, soul and mind are tested to their limits as the runner presses himself/herself to reach the finish line. 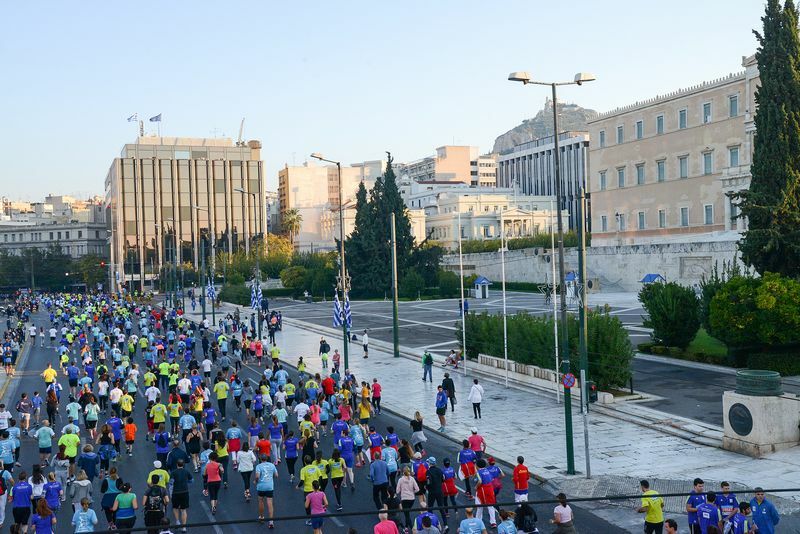 SEGAS, the Hellenic Athletics Federation, has the honor and the historic responsibility to organize annually the Athens Classic Marathon on the Original Marathon Course. Since 1982, the Athens Classic Marathon has been dedicated to Gregoris Lambrakis, the athlete, scientist and Member of Parliament, who was murdered in the 60s and, after his death, became a symbol of Human Rights. From the year 2011 onwards, OPAP S.A., the leading gaming operator in Greece and one of the major corporations in Greece and Europe, has been nominated Grand Sponsor of the event and its valuable support led to the significant upgrade of the race in all aspects. Thousands of runners from all over the world are expected to participate in every year's race. Apart from the sporting experience, they will have the chance to enjoy the traditional Greek hospitality, discover the fascinating landscape of our country and explore a city which is constantly improving its standards.